This is the first of several articles on a rifle I have purchased and my attempts to sight it in. I believe my efforts may help some other shooters produce better groups from their own rifle if they follow my methods of sighting in a target rifle to get the best groups possible. I purchased an Anschutz 1712 Silhouette Rifle recently. Its the most expensive rifle I’ve ever bought. Anschutz rifles are expensive because in the world of target rifles, and target rifle shooting, Anschutz has long been known as the best of the best. 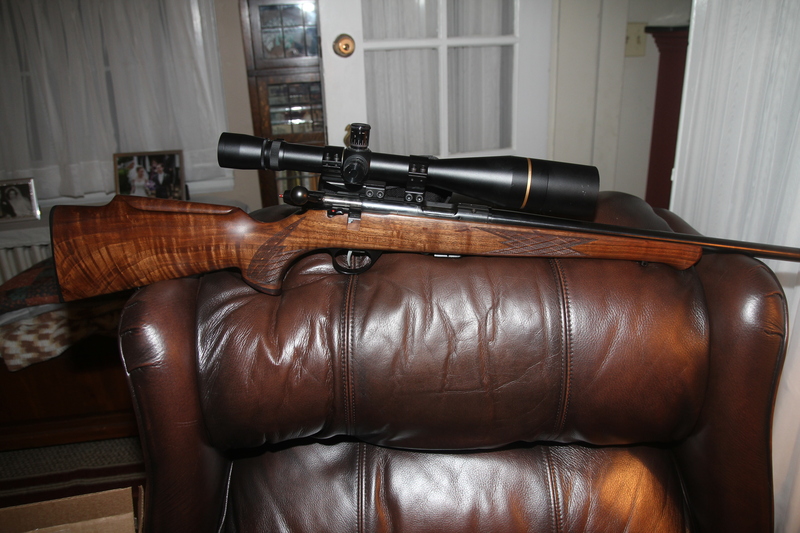 I purchased this rifle from the new Anschutz company housed in http://www.anschutznorthamerica.com/. The new company is located in Trussville, Alabama. I received this information from Creedmore Sports. Their website is http://www.creedmoorsports.com/shop/home.php. Creedmore has mostly target related shooting equipment. While I was browsing the Creedmore catalog I happened to notice the Anschutz Model 1712 Silhouette Rifle. It was a good looking rifle, made from the Anschutz Model 54 action and trigger. I clicked on the rifle to take a closer look and the Anschutz North America website popped up. So I emailed them about prices and availability. Bad move. I like good shooting rifles too much to ignore one. Trent Yates, Vice President of Sales emailed me back and within two emails I had decided to buy a new silhouette rifle. Trent sold me one which had beautiful wood on it. He threw in pillar bedding and allen screws holding the barreled action to the stock. Trent also included a brick of 500 rounds of RWS rifle match, and another brick of 500 rounds of RWS R-50 Jubilee commemorative ammunition in honor of RWS 75th anniversary. I was able to get all of this for a mere LOT OF MONEY! The ammo was included because the Anshutz business is also now a direct sales location for RWS ammunition. Included here is a relative term. It was included for an extra $200. However, on searching other sites, I determined the rifle match sold for over $100 for a brick, and the Jubilee was selling for nearly $200! So I felt I could get a return on my money if I wanted. Trent told me if I wanted to pay with a credit card that I could get the rifle in a few days, but if I paid by check he would have to hold the gun till the check cleared. Naturally I went for the credit card. I told Trent my firearms dealer’s name and sent Trent the dealer’s FFL and shortly my new baby was on its way. My dealer called me to say the baby was in. I went an picked it up. It was beautiful. Not many gunstocks have such figured wood in them without paying exorbitant prices. The action was smooth, though not quite as smooth as my other Anschutz’ that I own. I suspect it will grow slicker with time. If not, well that’s what valve grinder is useful for. The action on a target rimfire rifle should open easily with a flip of the shooting hand. The trigger was exactly what I’d hoped. A two-stage trigger, most of the weight was in the take up to the stop and only a little pull needed to get past the second stage before the gun fired. Perfect. I took the new baby home. I wasn’t immediately sure of a scope to mount on the new rifle. I was currently shooting with a CZ452 with a Barska Benchmark 8-26×50 with 1st plane mil dot reticle. This is the CZ website, but the 452 has essentially been replaced with the CZ455. http://cz-usa.com/product-category/rifles/. 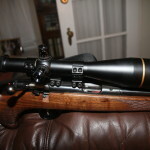 This next site displays the Barska Benchmark scope that is on my CZ. http://www.barska.com/Benchmark_Rifle_Scopes-BARSKA_8-26X50_BENCHMARK_SCOPE.html. This combination with Wolf match rimfire ammunition gives me about a 1/4″ group at 50 yards from the bench. By the time I arrived back home I had decided to remove a Leupold scope from another Anschutz silhouette rifle that I had recently retired and put it on this new 1712. The retirement was due to the weight of the other Anschutz which, with the Leupold scope was right on weight for standard rifle which is 10lbs 2 oz. This particular scope has been with me since it was first introduced. It is a Leupold Vari-X III 8.5-25X-50mm, Long Range. https://www.leupold.com/hunting-shooting/scopes/vx-3-riflescopes/vx-3-8-5-25x50mm-30mm-side-focus-target/, still in the website renamed the VXIII. See the website for the full description. 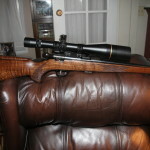 On purchasing this scope, I immediately took it to Premier Optics located in Kernsville, Virginia. Premier was a warranty repair shop for Leupold at the time. 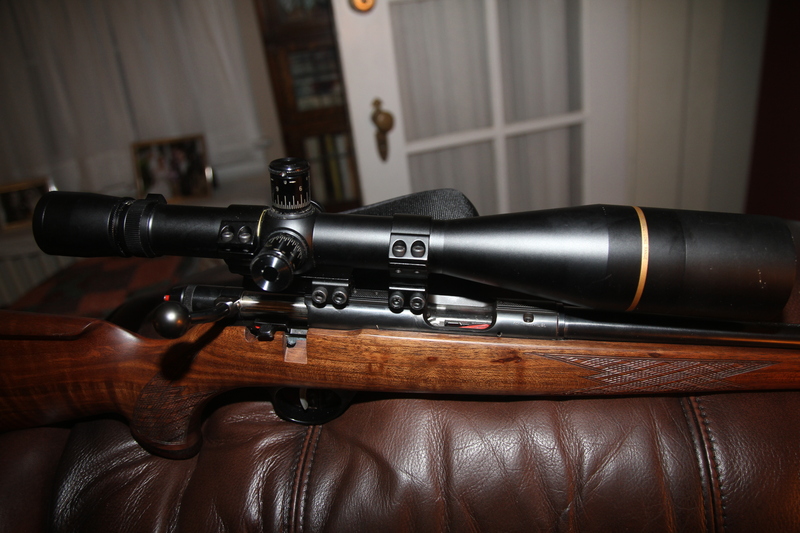 Premier had a line of scope reticles they would install and Leupold would continue to warranty the scope. The reticle I wanted was a GenII reticle variant of the original mil-dot reticle. The reticle was placed in the first focal plane so that when the user increased the scope power, the dots would appear to get larger as well. The difference in this reticle, however, was in between the dots were hash marks. For a target shooter like myself, this was perfect as the hash marks appeared about 1 1/2″ apart at 100 yards. So I took the baby to the range. I belong to the Fairfax Rod & Gun Club in Manassas, Virginia, web site of www.fxrgc.org/. I like to set my zero at 60 yards for silhouette. This distance is the pig targets. Pigs are the largest targets in a smallbore match, in relation to the distance shot. If I started at 40 yards, setting my zero there, there are too many clicks in the scope to do without an error in counting. In zeroing a rifle, it is best to shoot off of a hard level surface but have the rifle lying on something soft. I shoot off of a concrete bench at the shooting range with a concrete top. The rest for the rifle on this day were 3 shotbags filled with soft sand in the front, and a leather rifle bag filled with birdseed in the rear. Birdseed is light and can be easily moved around some. Soft sand can be shifted and will remain in place once the rifle is on them. I set up two targets that are bullseye, smallbore 50 yard prone paper targets. The reason for these instead of shooting at the pig targets is the prone targets give me a small circular aiming point for my scope crosshairs, a perfect target. Plus, I know from experience exactly how many clicks are needed to move the scope the certain distances of the scoring rings. The pig targets, on the other hand, have no definite aiming point inside the target so the 50 yard target is best. After setting up the targets, I shot 5 rounds of Remington Eley ammo thru the rifle . This was just to warm the rifle. I then shot 5 more at a sighting bull. The shots were in a 4 shot tight cluster of about 1/2 inch and the 5th one was out about an inch from the rest of the group. I cleaned the rifle thoroughly, but with no bristle brush, then fired 5 more rounds. Same thing….4 shots in a tight little cluster, and one outside the group. Not good, and not good for an Anschutz. I continued through the rest of the target, 5 shots on each of the 5 bulls, then clean the rifle with swab only. After the 5th bull of this, I changed ammo to Wolf Target ammo. I did the same arrangement on the second target after firing 5 unaimed shots with the Wolf ammo. Again cleaning the rifle after every 5 shots. Essentially I got the same problem, except that the 4 shots were in a tighter group than the Remington. I cleaned the rifle one final time and returned home with it. This was not good shooting, and certainly not good enough for silhouette match shooting. Something was going to have to be done. I will write about what was done in the next article.